The lovely couple held a very relaxed and elegant wedding on a beautiful Saturday blessed with good weather. There was no customary auspicious hour rush and they enjoyed their special day with grace and fun. Held in the Saint Andrew’s Cathedral which is the largest cathedral in Singapore, many love ones and guests turn up to witness their beautiful union. They also had a sword bearer military march-in at the grand ballroom of Fullerton Hotel for their evening celebration. The wedding of Jay and Patricia was casual and relaxed. In the morning, the groom was tasked to sing a Mandarin song for the bride before receiving her. His Mandarin was kickass! The weather was a blessing thus seizing an opportunity for a portrait session at the Gardens by the Bay. The celebration in the evening was held in the historic Chjimes. The decor was simple but romantic with tons of candles on the long dinning tables. We noticed some of Jay’s friends teasing him as ” Adam” and found out was due to his little resemblance of Adam Levine from Maroon 5! Haha! The gate crashing games were certainly a workout appetizer for the groom and groomsmen. Yoga and dance moves tested the groomsmen agility and strength before Eugene was allowed to change into his suit to receive Amanda. It was sheer fun packed in the morning! 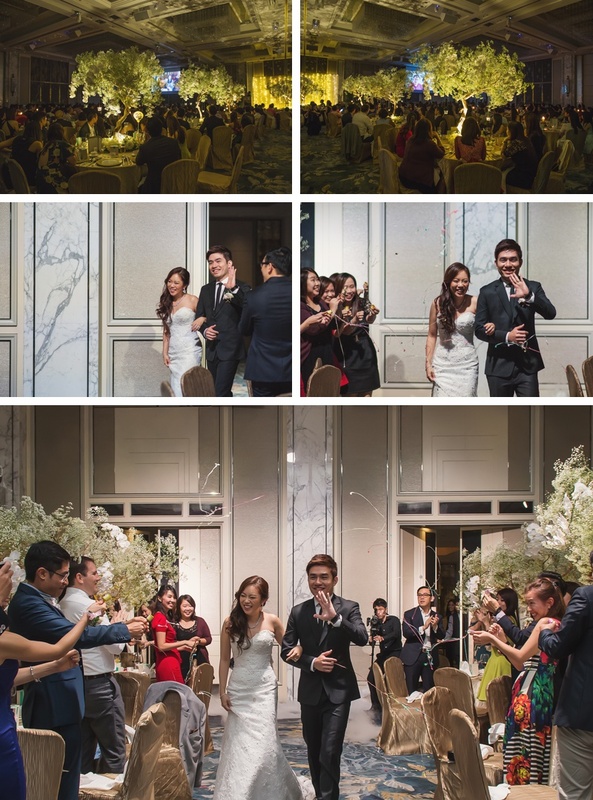 In the afternoon, the beautiful couple exchanged their wedding vows in the luxurious sanctuary of Shangri-la Hotel , Singapore. It was very cozy and intimate. Eugene is also a big fan of Lego. The ring bearer pillow was replaced with Eugene’s own Lego design. Check out the Lego bow ties in the images too. Quirky but cool! The ballroom was transformed into an palatial enchanting setting, giving it a dazzling ambience. Eugene and Amanda celebrated in fun, style and elegance. This is probably one of the most intimate weddings we have ever photographed. Anthony and Sarah solemnize their marriage in the colonial ambience of the Raffles Hotel garden lawn. The luxurious venue also complemented to their British heritage and it was a very cozy affair of less than 30 guests. It was just two hours of simplicity with no elaborate setups and no decor ; just two people so in love and their warmth loving families. Garrick and Sharon are a fun-loving couple with impeccable taste in making their wedding celebration both elegant and graceful. It seemed like we had stepped into a garden as the grand ballroom of Fullerton Hotel Singapore was dolled up with lush arrangements of flowers. Dozens of flickering tea cup candles also further amplified the romantic ambience of the evening. It was a great pleasure to witness the wedding with many of their closely bonded family members and friends, colourful performances by professional belly dancers and a wild session of flower tossing. Finally, we have to say this : Sharon mom’s Indonesian satays are out of this world! We absolutely adore this couple! Always laughing, always joking , always enjoying every moment of their special day! Adrian and Lin are not only very smart scholars from overseas, they are also very humble, polite and fun to be with. Together with their bridesmaids and groomsmen, fun was an understatement. Their solemnization and wedding was celebrated at Sofitel Singapore Sentosa Resort and Spa Hotel; a haven of tranquility and relaxation. A beautiful morning at the Sri Senpaga Vinayagar Temple, many guests dressed up in vibrant colored saris and eye-catching jewelry to attend the wedding ceremony of Kevin and Gaya. What enhanced the ambience was also the sun rays shining through certain spots of the spacious interior, making photography a breeze. This certainly excites us: light, colour and more light. The rituals were lively and the pouring number of guests created an ebullient mood; making this entire wedding ceremony vibrant with life.